Polish national Marek Kamiński is known mainly for having reached both the North and South Poles in the same year. In 1996, he created a foundation to help young disabled people and enable them to visit the polar regions. 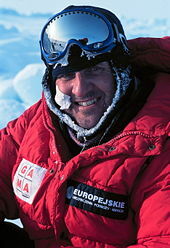 Polar explorer, author, photographer and entrepreneur, Marek Kamiński was born on 24th March 1964 in Gdansk. He was brought up in Pomerania and, in 1982, graduated from Władysław Broniewski high school in Koszalin. After that, Marek studied philosophy and physics at Warsaw University. He is the joint-owner of a company called Invena SA and created the foundation that bears his name. Marek lives in Sopot with his wife Katarzyna and daughter Pola. 1990: First polar expedition to Spitzberg, a trip of approximately 350 kilometres on skis. 1993: 'Trans Greenland Expedition', accompanied by Wojciech Moskal, is the first Polish crossing of the island (approximately 600 kilometres in 35 days). 1995: 'Poles to Pole' was the name of the expedition which saw Marek Kamiński reach the North Pole from Ward Hunt â again with Wojciech Moskal (770 kilometres in 72 days). 1995: 'A Pole at the Poles': a solo crossing of Antarctica from Berkner Island to the South Pole - 1 400 km in 53 days. 1996-97: 'Solo Trans Antarctica'. An attempted short solo crossing. 1997-98: Crossing of Ellsworth Mountains in Antarctica, reaching the summit of Mount Vinson, accompanied by Lerszek Cichy. 1998: Accompanied by Borge Ousland, expedition to the Bolivian Andes during which they reached the summit of Mount Potosi. 1999: Crossing of the Atlantic Ocean aboard the yacht 'Gemini', accompanied by Andrzej Piotrowski. 2000: 'Purmo Greenland Expedition'. Crossing of Greenland with Wojciech Ostrowski (600 kilometres in 13 days). 2000: 'Amazon Source 2000'. Expedition to the source of the Amazon, sponsored by the National Geographic Society. 2001: 'North Pole 2001'. First expedition to the North Pole as a guide. 2004: 'Together to the Poles'. Marek took a young disabled person, Jasiek Mela, to the North Pole. Jasiek had lost his forearm and a leg below the knee. He was accompanied by Wojciech Ostrowski and Wojciech Moskal. A few months later, in the same year, he repeated the feat, this time to the South Pole and without Moskal. 2005: 'Around the Baltic by dinghy'. A five-day trip to mark the 25th anniversary of Solidarność, with Mirosław Kukuła and Wojciech Ostrowski. Apart from that, Marek Kamiński (who is a member of the Explorers' Club in New York) has written a number of books, been involved in various films and received numerous awards and distinctions, including 'Young Businessman of the Year 1994' in the Polish section of the International World Young Business Achiever Competition, the 'Knight's Cross of the Order of Poland's Renascence' for reaching the North Pole (an award conferred on him by President Lech Wałęsa himself in 1995), the 'Sports Minister's Gold Medal', the 'TV Polonia Award', the 'St Wojciech's Medal', for making Gdansk known throughout the entire world, the 'Amber Butterfly' Award', the 'Explorer 2000' prize awarded by the festival of explorers in Łódź in 2000, etc. The foundation that bears his name is involved mainly in assisting young disabled people, helping them to travel to the polar regions, if they wish to do so. This might involve travelling to the North or South Pole and covering a few kilometres on the ice, or carrying out larger projects and taking part in actual expeditions.